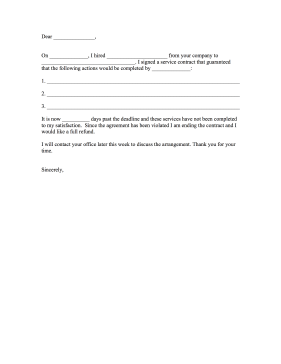 Customers dissatisfied with a contract service can request a refund by filling in the blanks of this complaint letter. It is now __________ days past the deadline and these services have not been completed to my satisfaction. Since the agreement has been violated I am ending the contract and I would like a full refund. I will contact your office later this week to discuss the arrangement. Thank you for your time.